Watermarks can be unfree, if they feature a logo or any copyrighted image. They may contain copyright statements, which affect the reuseability of the image. But Wikipedia is an inclusive project, your contributions are accepted, even if defective, with watermarks making them less useful. Of course, you do it on your own risk, they won't be nominated as quality images and won't receive any prize. You may get contacted by an editor, asking for a clean verion, you can help or not. 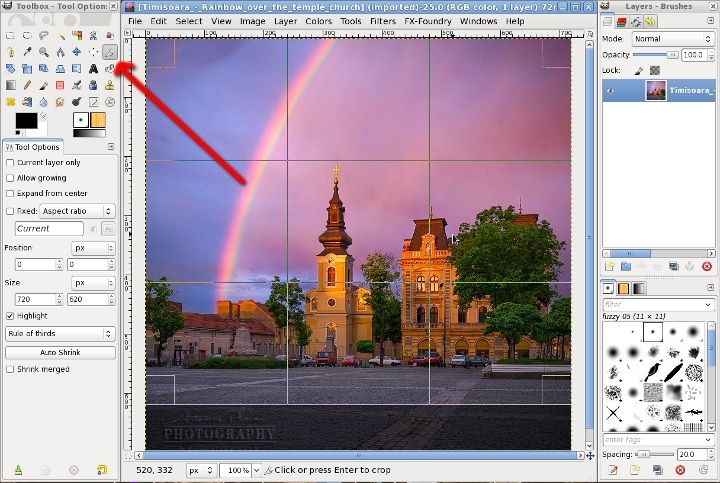 If you are an editor wanting to clean such pictures, Wikipedia also has some help for you, but this help is geared more to Photoshop users, with the GIMP part focusing more on loseless JPEG editing than watermark cleaning. If the cleaning is bad, the loseless part is less important, methinks, so this is why I will show here a few GIMP techniques. I am using for demonstration real files, submitted by a participant, Antonius Plaian in the Romanian Wiki Loves Monuments 2012 contest. There are downsizes to cropping, some (hopefully unimportant) data is lost and the composition is afected, the image won't look as intended any more. Is simple and sometime may work. However, if cropping does not work, we can use more advanced techniques. You need to make certain that the image from which you are removing the watermark is not in actuality copyrighted to a commercial or non-commercial source. People do not watermark images for nothing. If you are removing watermarks from photographs or artworks created by professional photographers, or graphic designers you will be in breach of copyright and of altering the intellectual property of a commercial entity. This is less of an issue if the image is your own, OR, if you have permission to alter that image as given by the original person that made it, i.e by removing the watermark. If not than you're in for a load of trouble or at least alot of unhappy emails from the original source of said image. In the image is on Wikipedia and under a CC-BY-SA license, then is perfectly legal to remove the watermark, that is the premise of this article, I hope you did read the introductory section. Then, as a photographer, I can tell you from my experience most of the time people add such watermarks for vanity (I don't talk about stock photography websites, but "XYX Photography"). Sure, is their picture, they can exercise vanity. But when the image is freely licensed, is also our right to remove it. PS: I was on the other side of the issue and had my watermkarks removed by commercial entities for commercial gain. I can tell you they don't bother with fine details, they butcher the image by cropping it. Nice article. These are all techniques I've used to eliminate watermarks. But for me, the purpose is not commercial gain. I publish a small newsletter for my neighborhood and often want to include topical clip-art to illustrate an article. More and more clipart today has watermarks in them, making them either useless or tedious to repair. Sorry, but I'm not paying what is often $25 to $50 for a simple clipart image for my non-profit newsletter. The watermark doesn't make be pay (for a non-marked version). What it does make me do is load up PS to remove it, or find one without marking. If I were producing a commercial piece and being paid for it, that would be a very different thing -- I would definitely license art properly. But I'm not. Clipart makers may disagree, but sorry....! I used the fuzzy select tool on this image and it worked incredibly well. For the feet, I selected the color with the dropper tool, fuzzy selected all of the interior leg, then deleted, and then did edit->fill with FG color. I repeated for mostly everything, and BAAM, it turned out like this. Be more careful, you lost all the shadows and highlights. But your image is a simple one, is a drawing, not a photo. In your place I would import it with Inkscape, trace the black outlines then fill with colors. The added benefit is having a vector image, ready to be resized freely. 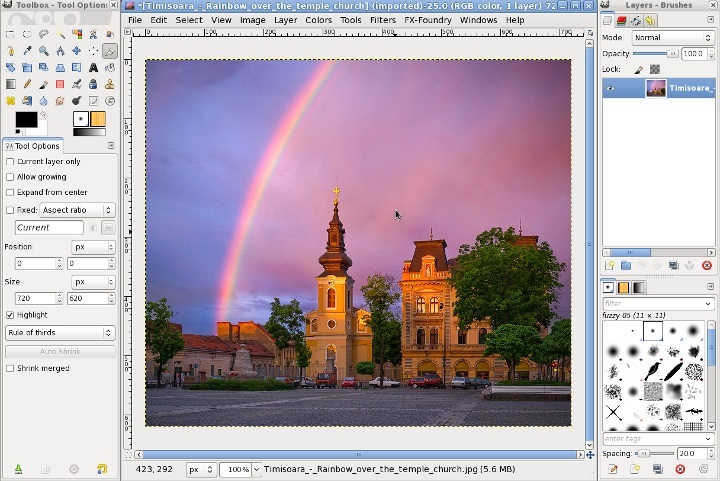 If you have the actual watermark image itself you can remove it from desired image with imagemagick , using this script (subtract image from another ) .